Gretchen Galiana Denman aka "Puppy Girl"
I missed out on all the love one gets from a dog until I was 61 years old and ended my career. That's when I suddenly--for the first time ever in my life--was struck by "puppy fever." Then Gretchen came into my life. An adorable salt 'n pepper mini schnauzer, she was only a few months old and not yet housebroken. For the first few weeks of our relationship, I took her outdoors about every half hour until she soon got the idea about where to potty. That lesson really "took", because when I later tried to train her to use an indoor puppy potty pan with liner when it was raining, she absolutely refused. Although she doesn't like the rain or even to get her feet wet, she knows that outdoors is her potty place, so mom just has to get the umbrella and we both brave the elements when necessary. Miss Gretchen was obviously smart, and quickly learned to sit, lie down and high-five. "Stay" was not something she was ever happy about, so a short stay was her maximum. She's still kind of iffy about "come." Sometimes she obeys the recall command immediately, but sometimes she ignores it. Since she's now 6 1/2 years old, it isn't too likely that will change. She only goes outdoors on leash, however, so it's not as critical as if she ran free and might get into the street. 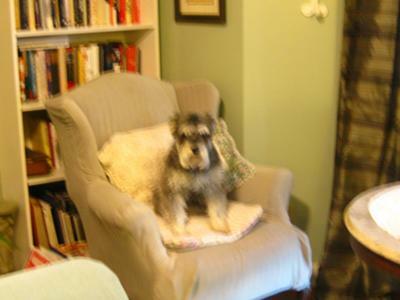 Like many miniature schnauzers, Gretchen "talks" in many voices. When I've been away from the house, or when another family member or friend arrives, her greeting is high-pitched and almost frantic with excitement. Her tone changes to a deep bark for the mail carrier and UPS delivery person. If I make her stop doing something, she tends to "grumble", a sort of mumble, mutter, mutter....It's so funny, but I try not to let her see me laugh. She dearly loves all my family and friends, wanting nothing so much as for them to all love her in return. She sleeps with me on her side of the bed, head on her own pillow for most of the night. When she wakens, she will lie there quietly until she's sure I'm awake, then she rolls over on her back and makes funny sounds until she gets her "tummy tickle." She even holds up her front legs so I'll tickle her "underarms", and this activity must last at least five minutes or she is fussy. Comments for Gretchen Galiana Denman aka "Puppy Girl"
Gretchen Galiana Denman "Puppy Girl"! That was a lovely story! You could have been writing about my little Ebenezer, whom we call "Puppy Boy" now and again. 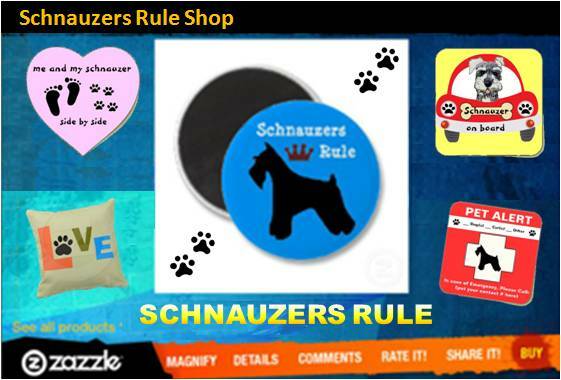 Just love their "Schnauzer-antics"! So glad you have each other. She sounds like the perfect pet! I related to every word. What a special love. Thank you for your story. Sue, in Southlike, Texas. Isn't the love & loyalty of a Schnauzer just the best! She is so adorable! !